The German Design Council “Rat für Formgebung Medien GmbH” has nominated CNet for the German Innovation Awards 2019. 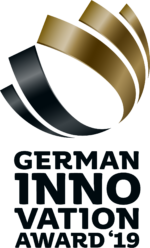 The prestigious German Innovation Awards recognises innovative achievements that distinguish themselves by their user-centricity and added value compared to earlier solutions across all industrial sectors. Innovations which have the potential to shape the future and improve our lives. The competition is aiming to identify and award innovations that contribute to a better future. In addition to engineering or other technological achievements, services are also taken into account. The experts of the jury focus on people, nominated innovations should have a positive influence on the lives. In the second year of the German Innovation Awards, the committee has decided to make the scope of the price international. CNet has been nominated in the category Information Technologies. The nomination of CNet’s Cloud solution for Care management as a Service awards us for an outstanding innovative achievement. We would like to take the opportunity to thank our project partners from the European project PICASO, A Personalised Integrated Care Approach for Service Organisations and Care Models for Patients with Multi-Morbidity and Chronic Conditions. Funded from the European Union’s Horizon 2020 research and innovation programme, agreement no 689209.